A great comorant in Victoria، Australia. ↑ BirdLife International (2012). 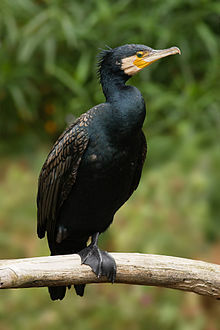 "Phalacrocorax carbo". IUCN Red List of Threatened Species. Version 2013.2. International Union for Conservation of Nature. http://www.iucnredlist.org/details/22696792. Retrieved on 26 نومبر 2013.